As a new parent, at times life can feel like a patchwork of moments haphazardly sewn together, and Brazilian artist Gabi Goncalves captures this sentiment perfectly in one of parenting’s essential accouterments — the diaper bag (for Maria Buzina). Much more environmentally smart than purchasing squares of material from fabric sellers, Ms. Goncalves uses recycled cottons and donated truck tarps to create a one-of-a-kind piece that is both fashionable and functional. These eco-chic bags are sewn and painted by hand, and they feature the standard compartments but are flexible enough to go from “diaper bag, to toddler tote, to general mom-everything-bag.” As a plus, each bag comes with the Maria Buzina insignia and a special ‘Thank you’ from the artist in Portuguese (with English translation). O nosso site �: www.mariabuzina.com.b Obrigada! Awesome product, It is beautiful. I like the idea of using recycled materials but I am a bit curious why it is so expensive? I mean weren't some materials even donated? I would buy it but not for that much unless you can explain why. Thanks! 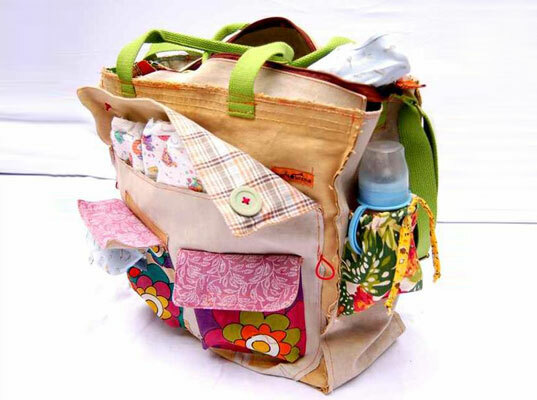 As a new parent, at times life can feel like a patchwork of moments haphazardly sewn together, and Brazilian artist Gabi Goncalves captures this sentiment perfectly in one of parenting�s essential accouterments --� the diaper bag (for Maria Buzina). 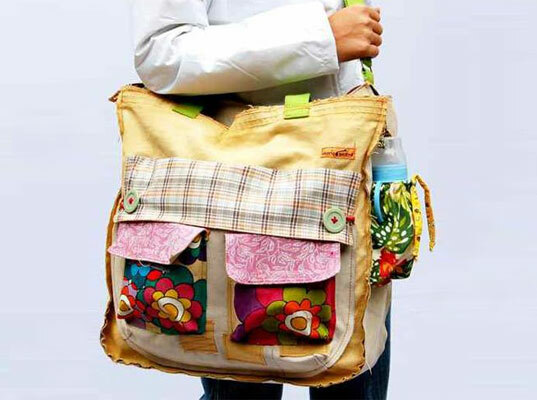 Much more environmentally smart than purchasing squares of material from fabric sellers, Ms. Goncalves uses recycled cottons and donated truck tarps to create a one-of-a-kind piece that is both fashionable and functional.